When designing lighting, inside or out, safety should always come first and exterior lighting ideally incorporates it without being obtrusive. Lighting for safety doesn’t have to be utilitarian and in fact can be quite eye-catching. For instance, attractive fixtures may be integrated into stairways or retaining walls, adding surface interest and rhythm while leading the eye to the destination. A single step is the most dangerous condition in any design; the hazard can be effectively minimized by lighting the edge of the stair. 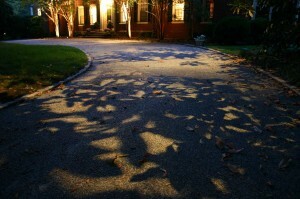 For truly magical effects, aquatic lighting adds a very special element to the landscape. Lighting extends the nighttime enjoyment. My own pond for instance, is accented with three lighting effects: uplighting a stacked stone waterfall, accenting elements around the pond, and underwater lighting to make our koi visible and provide wonderful animation. Our fish seem to recognize our nighttime presence and put on quite an entertaining show at feeding time. The move toward energy efficiency has driven most of the manufacturing changes in lighting in the recent past. In the landscape, the most exciting news is the emergence and continuing development of LED fixtures (light emitting diode). LED has historically been used in the electronic, automotive, and aviation industries but it has made its way into commercial and residential lighting, both inside and out. LED “lamps,” as light bulbs are called in the lighting industry, offer distinct advantages over conventional choices, including dramatically lower energy consumption, longer life, and sometimes greater durability and reliability. 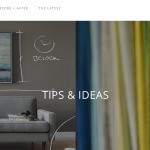 Expect design options, availability, and affordability to continually expand. Many new fixtures offer an “Energy Star” rating, signifying improved efficiency. Some landscape fixtures may be re-lamped with LED lamps, reducing energy use and allowing expansion of an existing low-voltage system. In some cases these choices may have higher initial cost, but the reduced energy use and longer life can actually make them less expensive in the long run. The greatest benefit of outdoor and landscape lighting is extending the enjoyment of your outdoor spaces and landscape into the evening hours. 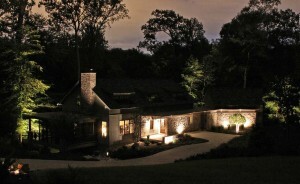 Especially during long hours of darkness during the winter months, exterior lighting takes on a whole new meaning. Strategically placed fixtures call attention to the beauty of unusual features in the winter garden such as exfoliating bark, bright red berries, or the interesting structure of a bare tree. Many areas in Virginia have substantial mild weather through the winter, and the added hours outdoors are particularly appreciated. Thank you to Inaray Lighting and Lighting by Design, both of Richmond, VA, for providing the some photos. Others by FORM & FUNCTION. Images are copyrighted, as are all images appearing in the FORM & FUNCTION blog.